Over the past few years, I have coached a lot of beginner players. One of the things which helps a beginner player improve is using a decent table tennis bat. A table tennis bat which has good control, but can also generate decent spin too. For most beginner players it can feel a bit overwhelming knowing which table tennis bat to buy. There is a lot of choice available – some very cheap, some very expensive – all claiming to be better than the rest. It really can be quite difficult working out a good table tennis bat from a rubbish table tennis bat. So in this blog post, I will give you some honest advice about which table tennis bats are good for beginners, which table tennis bats you should avoid and some specific recommendations on table tennis bats you can buy (plus links to where you can buy them). I think the most important thing for a beginner player is to have a table tennis bat which has the right balance between ‘control’ and being able to generate some decent spin. Let’s start with ‘control’. If you’re a beginner player, you will still be developing your technique. 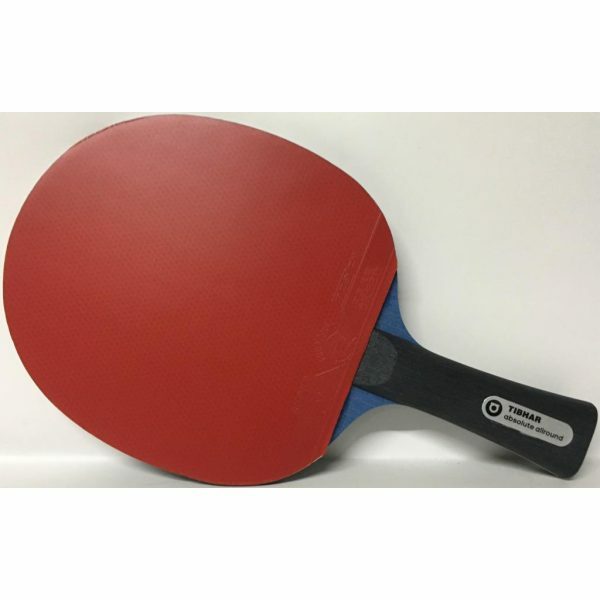 It’s best to start with a medium speed table tennis bat, as this will help you keep more balls on the table. It will be less responsive to the other player’s spin and a bit more forgiving if your technique isn’t quite right. However, you also want a table tennis bat which can generate decent amount of spin – backspin, topspin, sidespin. You need this to be able to play a range of shots – topspins, pushes, chops and devillish spinny serves. It’s a fine balance between control and spin. If you get a bat whch is too fast it can be difficult to control the ball but you can get lots of spin. If you get something too slow it can be difficult to generate much spin, but it’s easier to control the ball. So you want that middle ground. The medium speed bat, with a medium speed blade and medium speed rubbers. You should ideally buy a bat with rubbers which have ITTF approval. This means they have been tested by the world governing body, so you will be buying something of decent quality. If it has ITTF approval, you will see the ITTF logo on the rubbers. It’s a quality assurance mark, more than anything else. Generally, you should avoid buying really cheap table tennis bats. These are the bats which usually cost less than £10 / $10. They’re cheap for a reason – the materials used to make the bat simply aren’t very good. The biggest issue I have with these bats are that they are useless at generating spin. Some of the really cheap bats, play more like anti-spin rubbers. A player will play a drive shot and instead of the ball coming back with a bit of topspin, the ball comes back with no spin at all. 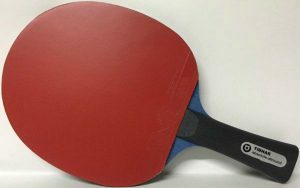 With cheap equipment like this, it’s much more difficult to learn the basic strokes and technique you need to play table tennis, as you have to play exaggerated strokes to generate spin. This leads to bad habits, which will limit the progress a player can make. A decent table tennis bat for a beginner player will cost in the region of £20-£40 / $25-$50. So on to my recommendations. The list below are all table tennis bats which I have tested myself and recommend to the players who I coach. My personal favourite (and the one my players seem to like the most) is the Bribar Winning Loop (read review). But all the table tennis bats listed below are very good choices for beginner players. BEST-SELLERS: Also, take a look at my list of the most popular table tennis bats purchased by readers of my website. You should do your own research too. All table tennis shops will stock suitable bats for beginners. On their websites look for ‘pre-assembled’, ‘ready-made’ or ‘complete’ bats. If in doubt, contact the shop and ask for their advice. Take a look at my list of table tennis shops in the UK, USA, Europe, Asia and Australia. If you’re a beginner, the most important thing at this stage of your blossoming table tennis career is to buy a bat which allows you to develop good technique, generate some spin, but is not so fast that you keep over-hitting the ball. A beginner bat won’t be forever. It will probably be good for a year or two depending on the speed of your progress. As you improve, you will need to switch to a bat more suited for an intermediate standard. If you only ever want to play table tennis for a bit of fun, it’s fine to buy any old rubbish. But if you’re serious about improving, you should avoid the really cheap bats. You don’t have to spend a fortune, but a little extra investment in a decent beginner bat will help you improve quicker. Thank you for all the great information! I just signed up for your newsletter. I had a bat/paddle question for you. I’m 56, and just started playing table tennis. I still borrow a recreation type paddle when I play. I’ve played regular tennis at a very high level my entire life, but my knees can no longer take that ;-). I have played ‘ping-pong” at friends houses occasionally over the years, and with my tennis background usually do well. But, have never played real or serious table tennis or tried to learn. But, I would like to learn and get to a level similar to where I was in Tennis. I’ve read your articles on Paddles, it sounds like either the Palio Expert 2 or Palio Master 2 would be a good starting point? I am not sure which one to buy or others? Any recommendations for me? Pluses or minuses of buying one vs. the other? I am OK if I buy one and need to buy another soon if that helps (not worried about the cost). Thanks for the kind comments. I recommend buying the Palio Expert 2 for your first bat. There isn’t a huge difference between the Palio Expert and Palio Master. The Palio Expert gives a little more control, which is useful for a beginner. This won’t be a bat for life. If you play regularly (and improve), you’ll need to replace the rubbers after 12 months and most probably upgrade to something better. But for your first bat, the Palio Expert is a good choice. Fantastic! Thanks very much Tom. I really appreciate it. I wonder if you have an idea about donic bats (carbotec 900 or waldner 3000)? I’m not familiar with these donic bats. But I have just done some research and I think they will be fine for a beginner player. My friend wants to start playing table tennis with me, but he’s also really interested in playing penhold. I told him that might not be a fantastic idea since we’re in the US, but nevertheless he wants to buy a penhold racket. Are there any decent beginner rackets for penhold, or is playing penhold with a standard shakehand racket alright? I assume it might be better to just get a blade and rubbers, but it’s hard to do that for cheap. Hi Rhys – your friend definitely needs a penhold blade if he wants to play penhold. It will be much easier to play penhold with this compared to a shakehands blade. I just had a quick look on Amazon, and it looks like there’s a few choices available for a decent price: https://amzn.to/2O4boZ4. The Butterfly 302 or DHS 6-Star should be fine for a starter penhold bat.